Is student-friendly with the popular Paradigm formatting. Prepares students for post-high school studies and careers which require critical interpretive skills in language, reading, and writing. Has four chapters of texts and activities booklets. Covers writing from ancient times to modern times. Teaches how to recognize literary characteristics and techniques. 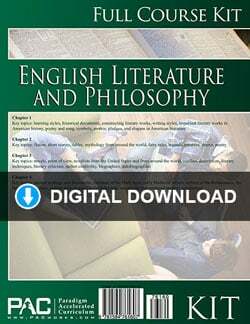 The Paradigm English IV Literature & Philosophy Digital Download Course Kit includes everything you need to complete the course in digital format: Text, Activities, and the Teacher’s Resource Kit, all in PDF format. Key topics in Paradigm English IV are listed by chapter. Chapter 1 topics include learning styles, historical documents, constructing literary works, writing styles, important literary works in American History, poetry and song, symbolism mottos, pledges, and slogan in American literature. Chapter 2 topics include fiction, short stories, fables, mythology from around the world, fairytales, legends, parables, drama, and poetry. 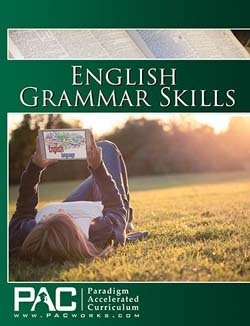 Chapter 3 key topics are novels, point of view, novelists from the US and around the world, conflict, description, literary techniques, literary criticism, author credibility, biographies, and autobiographies. Chapter 4 topics are ancient writings and documents, literature of the Dark Ages, early Medieval writers, writers of the Renaissance, the first modern writers, writers who changed social behaviors, and documents that produced modern government. 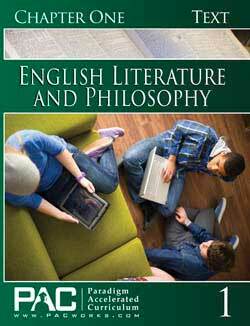 The Paradigm English IV Text Booklet Set includes one of each of the text booklets for Chapters 1 to 4 for the extra student. The English IV Activity Booklet Set includes one of each of the activity booklets for Chapters 1 to 4 for the extra student. 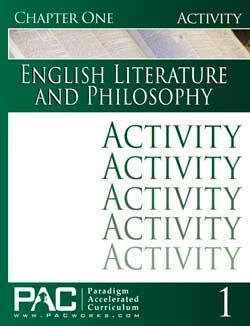 The Paradigm English IV Teacher’s Resource Kit (TRK) has the Activity Keys, Quizzes, Quiz Keys, Tests, and Test Keys.